This CORREA L30/43 CNC travelling column milling machine has been completely retrofitted by Nicolás Correa Service, S.A., to be finally sold to, and installed at a customer in Aragón, dedicated to component machining. The L-30 is part of the fixed bed travelling column milling machine range, specially designed for high volume, complex part machining. Thanks to its design concept, the moving mass remains constant regardless of the size of the part to be machined, given the fact that the part is secured to the bed, which remains in a fixed position for the entire machining process. The high precision finish obtained by this robust, high quality CORREA L30/43 milling machine, means that it is able to complete a wide range of jobs, guaranteeing maximum reliability and performance. “At Talleres Trisan we required a milling machine with a greater capacity, to allow us to meet the demands of our customers. Following a visit to NC SERVICE, we opted for a CORREA L30/43 milling machine, as its excellent performance and robustness were clearly demonstrated. We valued the quality and reliability of the CORREA brand, in addition to the professionalism and extensive knowledge of NC SERVICE, thereby guaranteeing that the retrofitted milling machine purchased would be just like new, when leaving its premises, yet at a far more competitive price. The installation, adjustment and response service obtained during the commissioning has served to confirm that we made the right decision. The CORREA L30/43 milling machine will allow us to machine large sized parts such as valve bodies, adaptors, enclosures, large sized frames, sluice gates, etc. In short, this machine will give us a greater production capacity, offer more versatility and will allow us to machine a large range of parts, while offering a superb quality finish. This is directed at enabling us to improve the quality of our products and services in order to achieve complete customer satisfaction." TALLERES TRISAN also wished to enhance the original features of this milling machine. With this aim in mind, they requested the inclusion of a new Heidenhain TNC-530 and a new auto-indexing head in the retrofitting of this CORREA L30/43. Therefore, the original Heidenhain TNC-407 was replaced by the new TNC-530, and the manual head was replaced by a UDG type Universal Auto-indexing head with indexed positions of 2.5º and high pressure internal coolant through the spindle. Thanks to these two new features, the CORREA L30/43 is now a technologically up-to-date milling machine, with improved features and offering even better performance than the original milling machine. 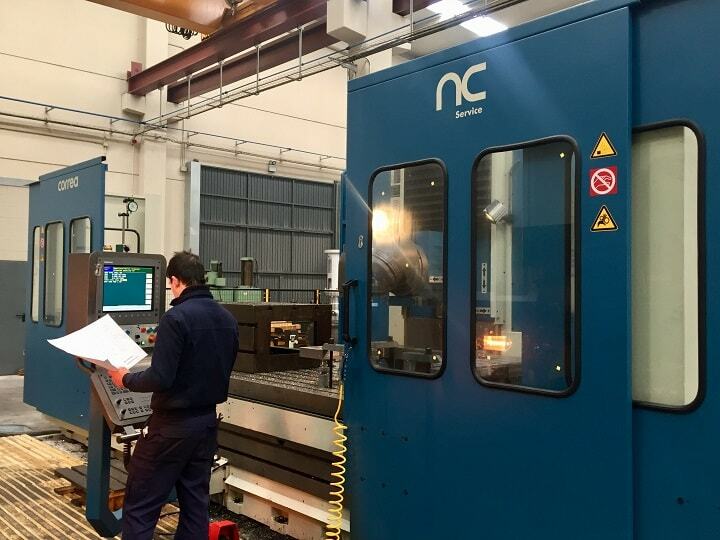 Following all this retrofitting work, NC Service conducted the manufacturer´s geometry and precision protocols in order to ensure the perfect operation of this milling machine. Finally, the installation and commissioning of the CORREA L30/43 milling machine was performed at TALLERES TRISAN. Thanks to this purchase, this company will be able to achieve an excellent finish on the machining of complex parts, as well as having increased possibilities of winning new work projects and opportunities.